Nintendo's third-quarter results are in and they're a mixed bag. Net profit tumbled by 36% compared to the same period last year, but sales were pretty stable, falling just 3.9%. Fine. Whatever. We hardly expected to discover that the Wii U had made a surprise overnight surge and outpaced PS4 sales. 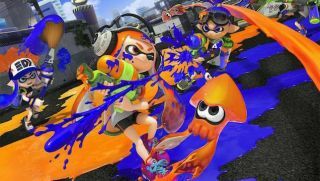 But there is some much better news here, the best of which, in my opinion, is that Splatoon has done excellently, selling 4.06 million copies worldwide so far. To put it in perspective, that's more than Bloodborne and The Order: 1886, two of the PS4's major first-party titles, combined. Splatoon isn't the only one going strong. Super Mario Maker, which launched in September, has sold 3.34 million copies, while Mario Kart 8 has sold 7.24 million since May 2014. But it's Splatoon which should have Nintendo and its investors celebrating today. The latest financials once again reflect that legacy franchises are bolstering the company right now, but even those have been drip-fed to the Wii U.
Nintendo has long needed a new IP, but launching one on the Wii U, a console with a relatively small user base (currently at 12.6m compared to the PS4's 36m) at a time where fan favourites probably seemed like safer bets, was a gamble. But it paid off. That a brand new IP has been so successful less than a year after launching is worth shouting about. The result of this, I hope, is that Nintendo will feel more confident in creating new IPs in the future. At the very least, I hope that we won't be waiting another five years for the next one. There's another reason I'm glad Splatoon has sold so well: it deserves to. The inky shooter was one of my favourite games of 2015, with its mixture of shooting, puzzle-solving and platformer elements, all wrapped into a family-friendly package. It proves once again that Nintendo is still on top when it comes to making games that are just… fun. This year will be massive for Nintendo. The company is set to announce its next "console", the NX, whatever that may look like. Some analysts are confident it will be a console-handheld hybrid, I think that makes sense. Some people think we'll see it on sale by the year's end, and I don't think that's an outrageous estimate either. I just hope that Nintendo takes its lessons from Splatoon forward. The company has had its fair share of flops, but as we've seen today, it still knows how to produce wonderful games that resonate with players, and that includes new IPs.